The 2012 Boston Marathon took place this past week. The Boston Marathon is a test of endurance. Completing it is the result of disciplined training. It is also a result of mind over matter; ask anyone who has ever run in the Boston Marathon. There is a point when your body is weary and you just want to sit down and rest. These runners will tell you that to get through these hard times, you have to be prepared to have a conversation with yourself, to focus on keeping pace and not letting your immediate desire short change the bigger goal. The good runners prepare for the Boston Marathon as much with their minds as they do with their bodies. I was flying out of Boston Logan Airport on a business trip a few years ago. 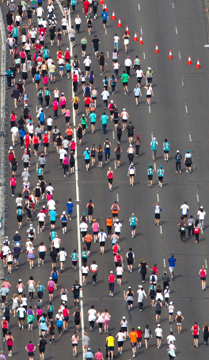 The Boston Marathon had been run earlier in the day and the majority of the plane’s seats were occupied by runners who had completed the race. You could tell because they were all wearing the same marathon T-shirt. But you could also tell by the condition of their bodies. These were people who were in superb shape – not an ounce of flab on any of them. (In fact, I have never felt more out of shape than I did on that plane flight.) They all talked about the race: where were the hard places, how the weather impacted their run, how they overcame all of it to finish the race. They compared training techniques and what had worked for them. In your business, are you making marketing plans based on encountering some bumps along the way? I find that, as businesses are making their way out of the storm shelters in the aftermath of the economic storms of the past four years, marketing plans are being formulated based on steady growth happening rather than sporadic growth surrounded by some hard challenges. For all that this election year of 2012 promises, little can be relied upon as being the solid foundation for an economic boom. This prolongs an unstable marketplace where one day’s good news is quickly negated by the next day’s downer. So how do you make a marketing plan work when one day your customer is ready to buy from you and the next day he is ready to board up the windows? Marketing planning often requires some of the same skills that go into fortune telling and forecasting the weather. However, you can cover your bases by building contingencies into your plans. In other words, if sales pick up and things are going good, we will follow a marketing path that rides that wave as long as we can. However, if we encounter a sudden change in market conditions that impact our sales, we will shift to plan B. This could include enticing clients with locks on pricing for an extended period of time that keeps them inflation proof. It might mean that you bundle products together to keep sales moving as a cluster rather than on single items. Whatever your plan, you need to have a marketing contingency in place because one thing is certain in these uncertain times: eventually you will encounter hard times along the way. Otherwise, the smallest of setbacks can send your business to the curb. Don’t think you can shortchange the process. In the changing times in which we live, there is a temptation to use marketing programs that are unproven and claim that they are the sure thing in terms of marketing leads, surefire sales, etc. Many of these are mere marketing posers. I was reminded of an incident that shook the 1980 Boston Marathon. That was the year that Rosie Ruiz won the women’s division in record time. Later it was discovered that Ms. Ruiz did not actually run the entire 26.2 miles. She had snuck upon the course without being detected and had only run one-half mile of the race: the final one. After the race, several runners and reporters talked to Ms. Ruiz about things they encountered along the route. She did not know what they were talking about. Then someone noticed she had barely broken a sweat and was not out of breath. Her thighs were a bit flabby. Suspicions arose. When the officials who manned the checkpoints along the course could not remember seeing her, and the second and third place finishers claimed she had never passed them, she was called out as a cheater and stripped of her win. Let me say that there are a number of pretenders when it comes to marketing programs. Make sure you are using methods that have a record of being successful. Plan for the bumps in the road and keep your mind set on the prize at the end of race.